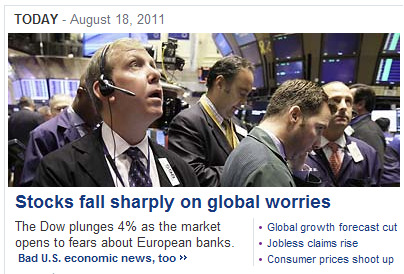 You can’t watch five minutes of television without being bombarded with grim news coverage of the world’s economy. Our brains are particularly hard-wired to focus on more dramatic, bombastic sources of information. “It’s about survival. It’s more important for our survival to avoid the bad than seek the good,” says Kuhnen. This instinctual reaction may have been helpful when avoiding a predator but in a time when information comes to us from sources motivated by a need for attention and profit, these emotional triggers can lead us in the wrong direction. Moreover, when the proper response isn’t clear we tend to base our reaction off those around us. If the we see a lot of people panicking, we panic even if there’s no reason to do so. This is precisely why there was such an overwhelming number of bank runs and closures in the 1920’s and 30’s. The positive spin on this is that the door can swing both ways. Kuhnen suggests everyone just take a deep breath and relax, or as she puts it “just chill out.” Most of the time there isn’t much new information being reported, just the same conclusions with a different spin. So if you’re concerned about your financial well-being, try to focus only on what has changed today—what are the facts today as compared to yesterday. Or it might be better to just stop watching the news all together. Either way, forget the opinions! If we can all manage to do this, we will also have a positive impact on those around us and just like that the economy might finally turn around on its own.